The actor states that it was the first time that he was changing his physique to look the part in a film. 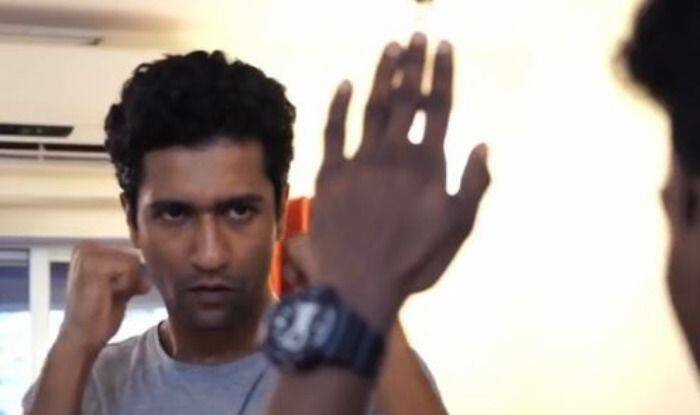 Building up the hype around his upcoming film URI: The Surgical Strike, lead actor Vicky Kaushal recently shared a video on his Instagram account that shows him flexing his muscles, preparing for the rough look he dons in the film and oh boy we are stunned! The actor states that it was the first time that he was changing his physique to look the part in a film. “The first task was to bulk up which for me was very difficult,” the actor is heard revealing in the video given his “beautiful problem” of not gaining weight whatsoever. Writer-director of URI, Aditya Dhar, came next on screen where he was heard saying that it wouldn’t have been a problem if it was not the demand of the role which Vicky plays in the film, that of a tough Indian soldier placed at the border. We see glimpses of Vicky working out, shirt no bar, while his voiceover plays in the background where he is heard saying, “Rakesh Udiyar was my trainer. He’s so badass that I call him jallaad.” Given that Aditya really wanted him to bulk up for that part to look like a person who has that aura and demeanor to give orders to his troops, the news that floated earlier was that Vicky had gained 15 kgs for the role. “He (Aditya) got me into boot camp training for a couple of months- running, crawling, falling, making formations, how to use the guns, how to crawl with the gun, getting to meet army men, understand the psyche, understand their probation periods… I feel truly lucky to be a part of URI: The Surgical Strike” says the rising star of Bollywood as he is seen living up to the role in the shared video. He captioned the video as, “A glimpse into my prep for URI. Not just me… me, along with a team of 20 other wonderful actors who gave their everything to the film. Big shout out to all my coactors, trainers and coaches… @rakeshudiyar ,Mangesh, @amol_kyatam @vickyarora @karannagari_mma #AtulMongia, ‘The Sikh Regiment’ @indianarmy.adgpi and the captain of the ship @adityadharfilms for giving me the most stimulating time as an artist. #URITheSurgicalStrike releases on 11thJan2019” (sic). Previously, the promising actor has many times taken to his Instagram account to show off his hard work for the role in the movie which is based on Indian Army’s surgical strikes across the Line of Control (LoC) in Pakistan-occupied Kashmir.